If you’ve ever wanted to escape as a couple to quiet beaches, charming gardens, and gorgeous natural scenery in New England, honeymooning in coastal Maine provides the ideal opportunity to do so. When you and your new spouse sojourn to Castine, Maine at the Pentagöet Inn and Restaurant, you will surely feel the romance come alive. This charming Maine B&B is surrounded by wonderful natural scenery and local activities that feel like they were specially crafted for the two of you to experience together. Boasting lavish gardens brimming with the aroma of the rugosa rose, our picturesque property presents a romantic retreat perfect for newlyweds. A slow stroll through our Woodland Garden provides the two of you with a relaxing activity to pair with a glass of wine before an unforgettable on-site dining experience. You can then savor a freshly prepared meal composed of farm-to-table cuisine prepared by our phenomenal restaurant staff. After indulging in a plate of local lobster linguini, a fine dessert, or a nightcap at the unparalleled Baron Pub & Wine Bar, retreat to a private romantic room that awaits you with all the comforts and amenities you could want. 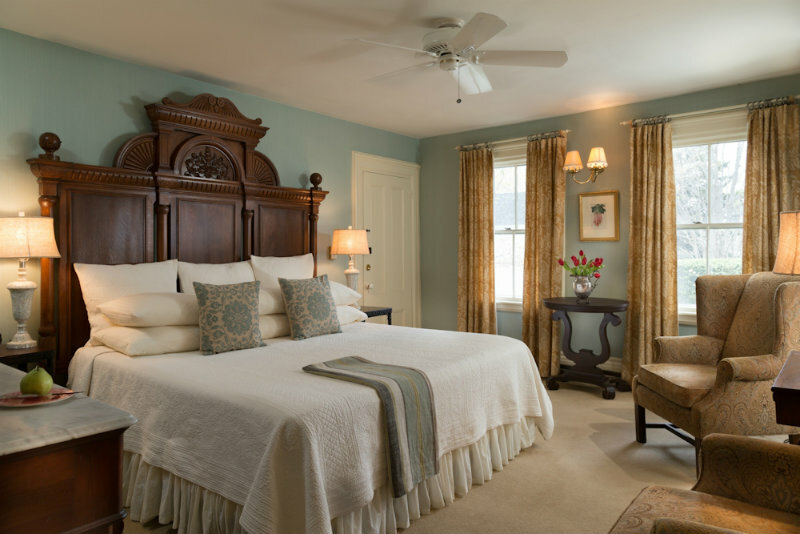 Hailed as on of the most romantic inns on the Maine coast, Pentagöet Inn and Restaurant offers guests a choice of a dozen rooms and five upgraded suites. This demi-suite in the Perkins House next door is decorated in calming tones of light blues and greens, offering the perfect atmosphere to relax with your partner while also enjoying views of the coastal Maine landscape. Complete with a king-size bed, marble tiled bathroom, and walk-in shower, you are sure to feel carefree and pampered. With delicate wallpaper embellishing the walls and king-size bed, the two of you will feel comfortable and cozy in Room #9, which includes a renovated bathroom complete with marble top sink and bathtub. Room #4 is sure to please with gorgeous views of the property’s garden and courtyard through three large windows opposite the king-size bed. Vintage Scottish lace curtains and wallpaper of roses set the scene of romance in this charming room. 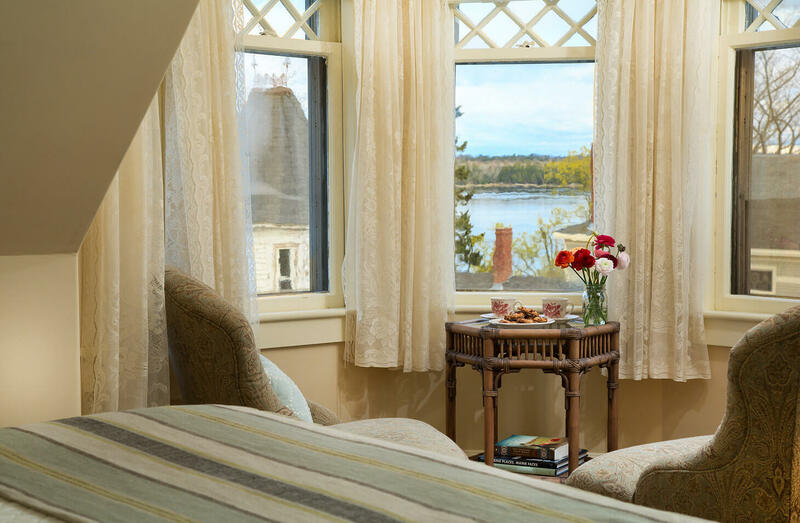 Castine is perfectly situated in the heart of the Blue Hill Peninsula in Maine, where the surrounding area provides a variety of activities for guests, and especially couples. Let us be your guide to fun and romance on the coast! 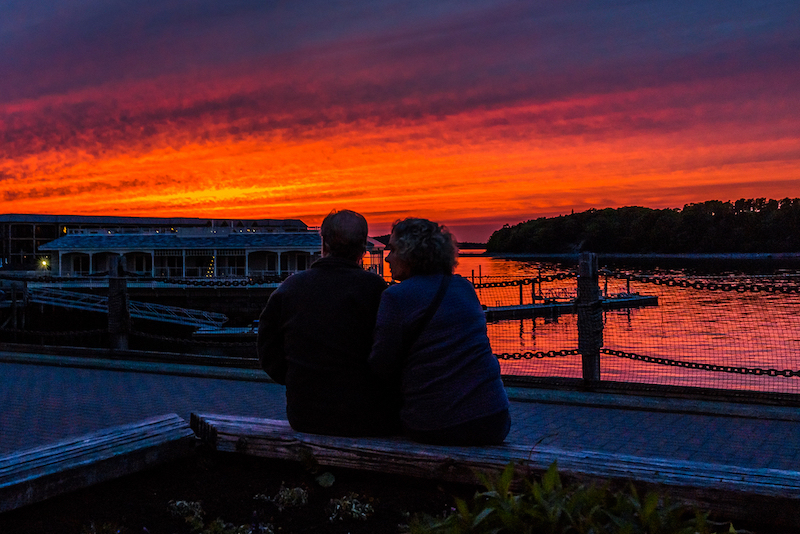 Here are a few of our top activities to customize the perfect Maine honeymoon itinerary. Enjoy a seaside picnic on a tidal beach: Grab a picnic lunch from Windmill Hill Gardens and Market or the quintessential Maine lobster roll from Bagaduce Lunch and head over to Horton Emerson Park in nearby Blue Hill. Embark on a bike tour of Castine: Jump on a pair of the complimentary bikes offered at Pentagoet Inn & Restaurant and head out for a leisurely ride around historic Castine, from Dice Head Light, to the town common and the home of poet Robert Lowell, to a hike in Witherle Woods preserve. It’s also another ideal opportunity for a secluded picnic. Get up close with the woods of Maine: All you need is your adventurous spirit to experience one of the most picture perfect hikes on the Maine coast in nearby Barred Island preserve. Wildlife viewing opportunities abound! Cruise the gorgeous Maine coast: Hop aboard with Guildive Cruises or the Isle au Haut Mailboat and choose between sunset sails, puffin cruises, and a full day of adventure visiting the truly quiet side of Acadia National Park. We’re only scratching the surface here of what a Maine Honeymoon could be when you choose to stay at Pentagöet Inn & Restaurant in the heart of mid-coast Maine’s less commercial, but naturally stunning area. The Pentagöet Inn and Restaurant not only sets the scene for a brisk coastal Maine excursion, but also an intimate honeymoon or couples experience. Book your newlywed escape with us and be sure to add our exclusive Celebration Package to enhance the experience with romantic details and special savings! This package is the perfect way to treat you and your loved one to the quiet, comfortable, charming retreat you both deserve!